Does a Single-Use Sensor Make Sense for Me? Home » The Rapid RH® Concrete Moisture Test » Concrete Information & Knowledge Base » Does a Single-Use Sensor Make Sense for Me? There’s been a lot of buzz around our new reusable Rapid RH®5.0 Smart Sensors, and rightly so. The 5.0 reusable has game-changing technology that reduces the time, labor, and initial investment costs of using reusable relative humidity (RH) sensors to about as low as they can go. So why would anyone want to stay with a single-use sensor? The answer is: It makes possible an RH test that requires no maintenance – zero. For you, the Rapid RH®4.0 EX remains the standard for fast, easy, highly accurate and low-cost concrete moisture testing. Done. That’s all you ever have to do to use our single-use sensors. You never need to run a calibration check. You never need to get the sensor re-certified. The 4.0 EX single-use sensor just stays in the hole, ready and waiting for you to take a reading. This is a good place to clear up a common misunderstanding. Some people may be hesitant to buy a single-use RH sensor because they think it means the sensor can only be used once to provide a single reading at one point in time. Not true. The 4.0 EX is “single-use” because it can only be used in one test hole. That hole becomes the single-use sensor’s permanent home. Once you insert that 4.0 EX sensor into its test hole, you can go back to it time and again to get additional RH readings. 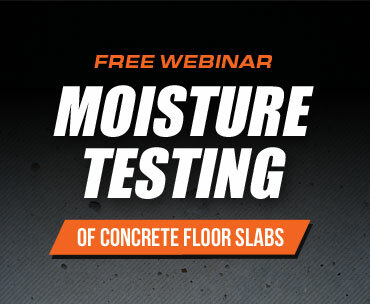 When you look at your current moisture testing method, what’s your reaction? Is conducting moisture testing in concrete what your business is all about, and you’ve been looking for an accurate, yet manageable and cost-effective reusable RH sensor? Then, by all means, check out the 5.0 reusable sensor. Are you a flooring or general contractor who’s happy with how the single-use Rapid RH®4.0 EX works for you? Then stick with it. You won’t find an option that’s easier or more accurate than the 4.0 EX for measuring the moisture condition of a concrete slab. Are you still using the old calcium chloride test? Don’t let fear of ASTM F2170 requirements keep you from using the more reliable RH testing method. We designed the single-use Rapid RH®4.0 EX system with you in mind. The 4.0 EX makes complying with ASTM F2170 completely hassle-free. A NIST-traceable certificate of calibration comes with every 4.0 EX Smart Sensor pack and is your assurance of proper calibration. In addition, using any one of our time-saving data collection tools (such as the DataMaster™ App) will simplify collecting, storing, and reporting the required data. Bottom line: If using the easiest, most hassle-free method to conduct a concrete moisture test is what makes sense for your business, then the single-use 4.0 EX system is the choice for you.